The Internet of Things is going to change the models of business of the financial services sector, unveiling new legal issues. I have already discussed about how the new models of business of the Internet of Things (IoT) are going to be disruptive, placing companies in front of legal problems that they had never experienced before. And the same rule is valid with reference to financial service sector. According to an estimate of BI Intelligence, there are at the moment 7 billion IoT devices, but the number is going to quickly climb to 22.5 billion by 2021. I don’t like this kind of estimates, but there is no doubt that according to analysts Internet of Things devices (i.e. connected technologies) will be anywhere around us, in any business, in any device, in any network and even on any individual. 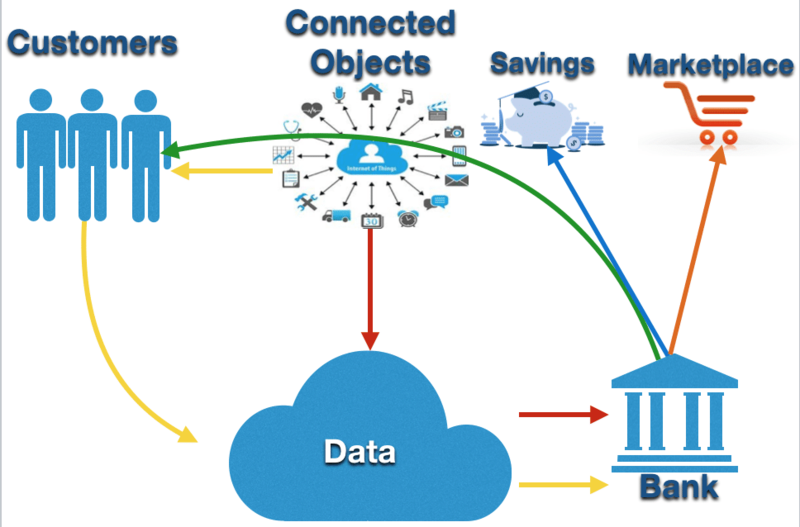 This scenario is expected to create the so called “Bank of Things” that relies on the collection customers’ data from any of their devices in order to offer different services to them. create a marketplace of data to be exploited by third parties. This is the most interesting (and less explored at the moment) line of business. If sensors are embedded on any device/machine/plant, banks would obtain a massive amount of data that can be a very valuable resource for their business clients which are interested to run any type of business. will be used not only to ensure the proper performance of financial transactions, but to provide services, gain savings and share data with third parties. keep the existing criminal sanctions and orders of deletion of data. Also, the current draft of the ePrivacy Regulation extends its scope also to M2M communications and therefore the perimeter of privacy rules might apply also in case of processing of non-personal data. the adoption of technologies able to minimise the risk on illegal access to data and identify unlawful treatments in order to timely react to them. A larger amount of data collected from different sources inevitably causes also an increased cyber risk. I already discussed in this blog post that Internet of Things technologies, as any technology, cannot be 100% secure. the appointment of a data protection officer. guarantees that in case of data breach or unlawful processing of personal data, uncapped indemnity claims can be brought against banks. data can be considered trade secrets or can be protected under antitrust regulations, making its exploitation an unfair competition conduct. The European Commission is considering to introduce new rights to protect IoT data, but the above are the most frequent available options. The new data portability right introduced by the EU General Data Protection Regulation is both a resource and a risk for a business. I thoroughly covered the issue in this blog post. It seems obvious, but currently a number of companies are collecting data without actually using it, just to create their own database. Such conduct would not only be in breach of privacy regulations, but also might lead to misleading advertising if an expectation of getting an actual benefit from the provision of data is created in customers. If you found this article interesting, please share it on your favorite social media.